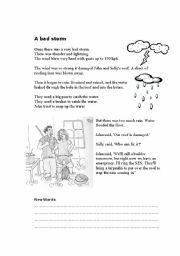 Simple reading about a bad storm with heavy rain, leaking roof etc. Useful vocabulary for this type of home emergency. Feel free to change SES (State Emergency Service) to your local emergency service. A reading in the first person. Followed by various exercises to re-inforce the vocabulary used in the reading. Includes a question forming exercise, a crossword puzzle and a Wordsearch. Editable. Pre-Intermediate. Answer Key included. A simple story about making an appointment to see the dentist for a check up. 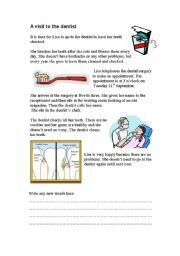 Comprehension questions and useful conversation practice for making appointments and attending the dentist�s surgery. 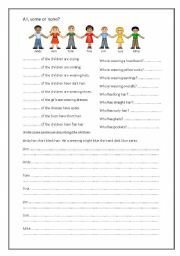 A worksheet intended to introduce the idea of active vs passive voice. 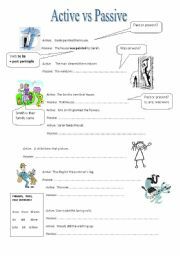 Uses illustrations and simple vocabulary with hint boxes to help students remember what is required. 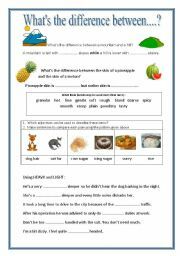 Also a way to show one use of the past participles they see in their lists of irregular verbs. Answer key included. Fully editable. Using adjectives to describe and compare. Expand students vocabulary and writing skills. Fully editable. Answer Key included. Vocabulary practice and choosing the right adjective to descibe the picture. 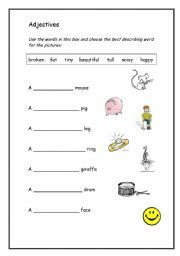 A worksheet which revises basic parts of speech: adjectives, nouns, verbs, and adverbs. Good for introducing adverbs of manner. 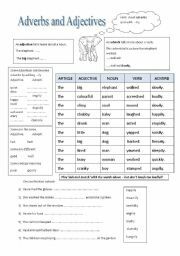 Fill the gap exercise, matching adjectives and adverbs. A mix and match exercise should produce some amusing results. Answer key included. Fully editable. Join the picture and the animal name. Some less common animals included. 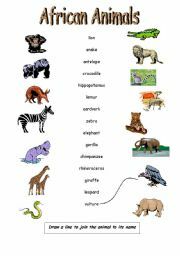 Label and learn the English names of African animals. 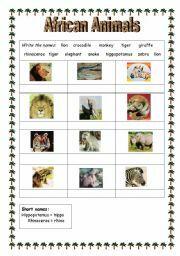 Practise using �What is this?� �This is a......� Answer some who am I questions by reading the descriptions of the animals. Cut out and paste pictures in the correct boxes. 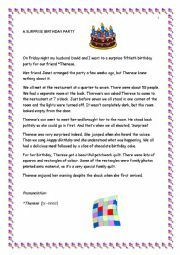 A worksheet for practising the use of ALL SOME and NONE. Also includes revision of descriptions of people, what they are wearing and colours.Questions to answer: eg. Who has short hair? Students are then asked to write their own descriptive sentences. Fully editable.